What do you do when facing the top line of poster boys from the defending, Stanley Cup Champs. You bring the fight to them....try to muscle them at every turn and then you try to keep up as they start to run...Scratching and clawing for every goal along the way. What is there that can really be said about the close game between a a fairly young team thats trying to stay on top and a bunch of young hard chargers that are looking to change places with them. Somebody's got to lose. It appears our team may have gotten the message, that it doesn't have to be us. Perhaps squaring off against the defending champs provided that extra bit of incentive for Rangers, young and old to give it that little extra. 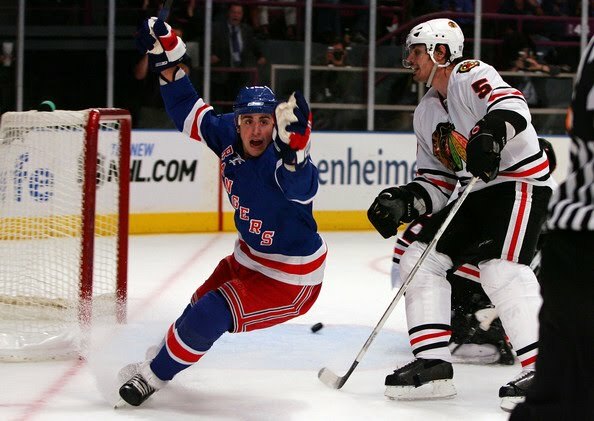 The team itself... for its fight, determination, defiance, manic energy is defined by the trio of Anisimov, Dubinsky and Callahan. For these young players and teammates like Prust and Boyle... the clock never stops, the ice is always fresh and the puck is always within reach. The perspective seems to be a bit different from a year ago when they were the new faces, 4th and third line guys that were just trying to do their part and not make mistakes. Theres a new energy and a new confidence. It can be seen in the forwards like Fedotenko, Stepan, and Avery and in the far reaches of defense of Staal, Del Zotto and even the Mystery D-man rotated in for the night. Whenever the team plays like this, a win is always within reach, mostly because it seems to hone Lundqvist into a razor sharp goaltender by giving him something to defend. Whether it's a one goal lead or only a one goal deficit. The team can learn to put its confidence in one another to have their part... and let their teammates handle the rest. Perhaps this is exactly what doctored ordered for Gabby, Hank and the other pillars of the team. To have the weight taken off their shoulders and placed in the hands of everyone who sees ice time. Even guys like Boogaard, Eminger and Roszival and benefit from this as long as the rest of the team stays out of the box and words hard to kill off any penalties that may be racked up. Whatever it is.. Its catchy and lets hope that this fire burns hotter with the return of Marion Gaborik and Chris Drury and doesn't find itself snuffed out. Keep the train rolling, boys....Lets go Rangers!